World4You Review 2019: Is World4You a Good Hosting? One of the pioneers in the Austrian web hosting space, World4You now hosts over 293,000 domains on their servers. Their flexible, affordable, and feature-packed hosting plans are especially popular with beginners. Founded in 1998, World4You is one of the pioneers in the Austrian web hosting space. From their customer service track record, it looks like they mean to stay as the leading hosting provider in the country. Their web hosting plans are packed with features and are very beginner-friendly, which explains why more and more customers go with them every day: they now host over 293,000 domains on their servers. It’s rare to find an entry-level plan that includes multiple domains and unlimited data transfer, so that is a nice perk. What really makes them stand out is the fact that they reward customers for loyalty: every year you stay with them, you get an extra 1,000 MB of storage. Also, their twin-hosting technology ensures even better uptime and security for your website. Essentially this means that your data will be hosted at two separate data centers so should one server ever be compromised, the other will simply kick in. An additional bonus World4You gives their customers is their cloud storage service: you get 5GB of space with the basic plan and can access your cloud storage from anywhere. Sadly, there are no databases or cron jobs included in their basic plan: you’ll have to choose either their DomainServer 2018 or DomainServer Pro plan for that. World4You doesn’t give an uptime guarantee on any of their shared hosting plans, though most users report no issues in this area. All shared hosting packages also include Easy.Install, an application installer that supports PHP and MySQL. The installer comes with the most popular CMSes, such as WordPress, Joomla!, and Typo3. 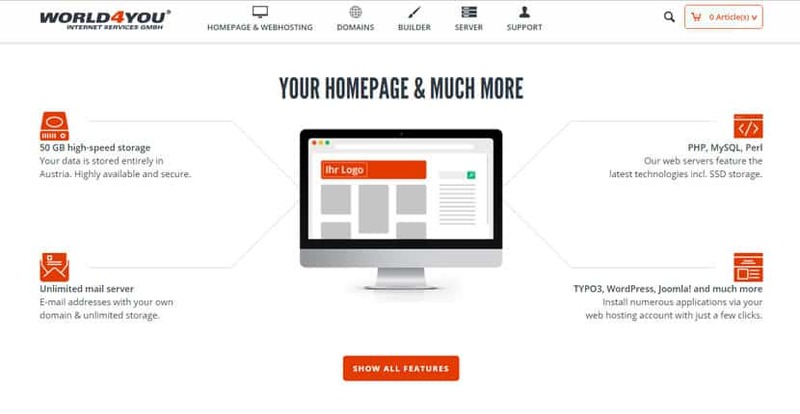 You also get a website builder with hundreds of free templates – great news for beginners who want to get a simple website up and running quickly. Strangely enough, World4You’s website isn’t mobile-responsive, which may be an oversight on their part. It also makes me wonder about their website builder and included templates. That said, while this is a minus, it isn’t a deal breaker since it’s simple enough to acquire fully-responsive themes for your website. World4You also has VPS hosting and colocation services available. World4You’s packages are priced amongst the most affordable in Austria, particularly with the number of freebies and great server performance you’re getting. On top of that, you aren’t tied to any contracts or hit with any hidden costs: you can cancel your account at any time, and you’ll only ever pay the monthly fee you signed up for. There are no free plans, nor does there appear to be any sort of money back guarantee. However, given that they have a high price-to-performance ratio, I’m not complaining: you get what you pay for after all. World4You CEO Johannes Kührer has a motto, “We take your opinion seriously!” and it appears that their customer support has taken this motto to heart. While they’ve received bits of negative feedback since their inception in 1998, they’ve been quick to act and implement improvements accordingly. For instance, one user complained that there were no free SSL certificates – and World4You swiftly worked to include this in all of their hosting packages. This attention to detail and high customer service orientation bodes well for the future of the hosting company as well as their clients. World4You offers support primarily through a ticket system and telephone hotline. There’s no live chat, unfortunately, but they do respond very quickly during office hours: in my experience, most of my tickets were resolved within the hour. If you encounter problems outside of office hours, not to worry: they have a 24/7 emergency hotline through which you can reach a technician day or night. World4You has definitely earned their reputation as the leading hosting provider in Austria, and it looks like this isn’t about to change. With excellent server performance, high reliability, and solid customer support systems in place, those who opt for World4You will be well-satisfied with their packages. Wondering how World4You stacks up against other Web Hosting companies? Enter any other Web Hosting company and we will give you a side-by-side comparison.